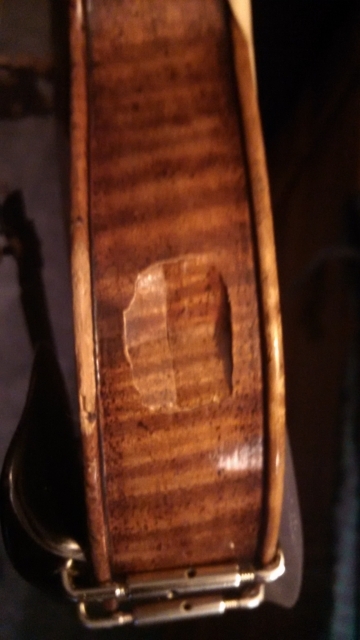 Would like some opinions on a repair for My Violin 15 years or more it received some damage to the side of it to, to repair it properly the top has to come off and I'm having second thoughts of popping the top off for repair, she about 100 years old and other than that damage in good shape I'll include a picture of the damage see what you all think. Also included is a picture of my bridge its fairly flat compared to classical set up, I'm thinks of changing it out to one set up classical, any thought on if the sound will be better if this is done have read it would, I don't know. 100 yrs old? I would not advise messing with that yourself, unless you maybe have a lot of experience in instrument repair and/or really love taking risks. There isn't much of a way to be sure how extensive the damage inside is from an outside view like that, either. The bridge doesn't look too flat to me exactly, but it does look a little odd. 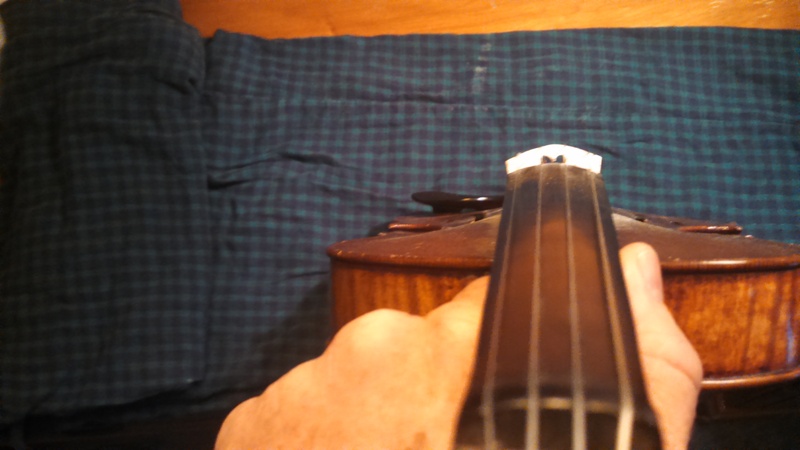 Usually the curve of the bridge is a pretty close match to the curve of the fingerboard. Maybe that one was cut the way it is to accommodate some particular playing style like cross-tuned fiddle or something? I've just never seen a bridge that was sorta triangular like that. Maybe some of the more experienced folks here have seen bridges with that sort of curve, though. Since you've had it for 15 yrs, I assume that it plays well and sounds good with the bridge as it is? Personally, I wouldn't assume that just changing the bridge to a more classical type would automatically guarantee improving the sound. Any bridge change will almost certainly change the sound in some way, but that isn't the same as saying you will like it better. I would not suggest trying to fix that yourself. If this were a flamenco guitar (my closest analog to a violin) I would point out there are three options. 1. Brace the damage with a small strip of wood glued above and below the crack, going widthwise across the ribs. This is the easiest solution, and least likely to change the tone of the instrument. 2. Replace that section of rib entirely by removing the top and the ribs in that section. This will likely change the tone of the instrument drastically, and should only be done in the case that the damage will spread and cause a catastrophic failure. Most often this kind of repair will cost about 30 hours of time (that's how long it takes me to reliably fix flamenco guitar cracks), and if the luthier is really, really good he can get it to sound similar to how it sounded before he had it. Anytime I have added wood or taken wood away from any acoustic instrument it changed the sound, whenever I have braced a crack like that it hasn't affected tone. Either way, I would take it to another luthier to work on, even if it was mine. Objectivity and all. That's a beautiful instrument though. I know enough from working on these violins that I would easily do a new bridge to suit your taste in playing, but I wouldn't touch that other repair. Even though I do some work on violins, I know that takes a special kinda talent and some special clamps and some techniques you probably don't have. I'm smart enough to know I don't know. Take it to a shop, plan on at least $100 if not $3-400 depending on the internal damage to the wood fibers. I'm not an expert but I've seen my Luthier master workman make some miracle repairs. In case you plan on taking on a new bridge project, here's a thread and a pdf I made 2 years ago and posted here. It can be helpful.